Smartphone Fanatics: Are Lumia Smartphone Sales Softer Than Expected? According to a story in today's Wall Street Journal (link, subscription required), sales of Nokia's Lumia Windows Phone 8 smartphones may not be selling in the US as well as carriers had hoped. Deals on the flagship Lumia 920 and 822 smartphones can be found at online retailers like Amazon.com for as little as $0 - $39 dollars depending on carrier and phone configuration. For example, the high-end Lumia 920 can, with a new 2-year service agreement, can be purchased for $39 at Amazon.com. At AT&T stores, the phone is still on sale for $99 with a new 2-year service agreement. Amazon.com also has the Lumia 822 on Verizon Wireless is free with a new 2-year service agreement. 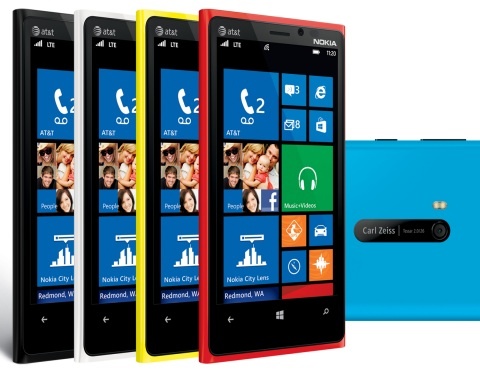 Without a contract, both the Lumia 920 (AT&T Wireless) and the Lumia 822 (Verizon Wireless) sell for $449.99. Offering smartphones at a deep discount is not uncommon for phones that have been out for six months or more as a promotion to drive sales of new phones in advance of the next year's model coming out. It is also a tactic that manufacturers use with their carrier partners to help drive adoption of their phones and their mobile platform. What is raising eyebrows is the timing of the discounts. The Nokia 920 and 822 have not yet reached the six month mark. We know US adoption of smartphones running Microsoft's Windows Phone 8 mobile operating system hasn't been selling as well as Microsoft had hoped. So what's really going on here? Are AT&T and Verizon trying to drive sales of these new phones with a limited-time, post Christmas discount program? Is Nokia providing further incentives or marketing support to drive up their year-end sales numbers? Is Microsoft somehow involved in an attempt to drive up market share numbers against Apple's iOS and Google's Android platforms? Without sales numbers or an official statement from one of the major players involved it's hard to know for sure. Deep discounts on new smartphones are not completely uncommon, however, this close to a new product launch does send up some red flags.